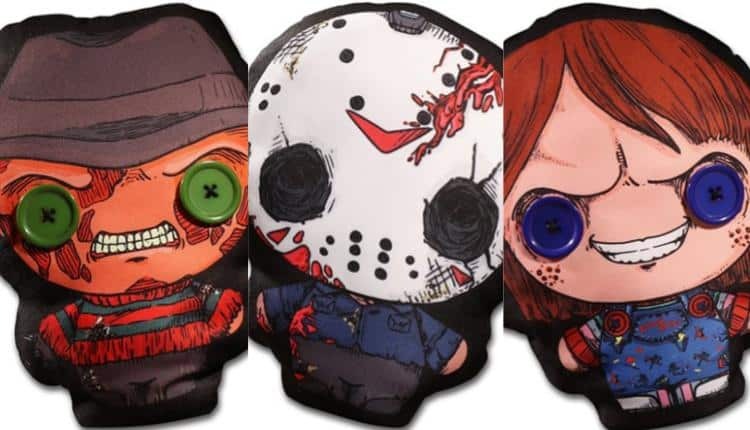 Flatzos Freddy, Chucky, and Jason Plushes Are Murderously Cute | Nerd Much? These Flatzos Plushes from Entertainment Earth currently come in three different characters: Freddy from Nightmare on Elm Street, Chucky from Child’s Play, and Jason Voorhees from Friday the 13th. They each measure at 12 inches, so just big enough to treat like an actual plush to cuddle, and to use as an accent on your couch. What fashion forward nerd wouldn’t want a classic horror themed pillow in their living room? Each Flatzos is priced at $13.99 USD, somewhat reasonable for the level of detail on these plushes, especially the real buttons for eyes on both Freddy and Chucky. Jason just gets a void for eyes, just like his soul. You can pre-order them now but they won’t be coming until July 2018. If you’re a fan of these class horror movies, these plushes are a must to show off your nerd pride. Nightmare on Elm Street was critically acclaimed for its underlying theme of sexual morality. Essentially the more sexually promiscuous or deviant the teenager was, the faster they’d be killed. This theme had a tendency to be caught between the dreams of teenagers and their realities, leading to that moral grey area horror movies are so fond of. Child’s Play was one of the most popular films that took a child’s toy and turned it into something sinister. In this case, a murderous cursed doll named Chucky. As such, at the time of its release, there were quite a few concerned parents that believed the film would turn children towards violence. This was never true, of course, no child ever committed any kind of violence just because they saw a Chucky movie. That said, the third movie in the series (Child’s Play 3) did inspire at least one murder in real life committed by a gang leader at the time. He had recorded the phrase “I’m Chucky, wanna play?” And left it with the body. Friday the 13th, however, was not so well received by critics. They cited the lack of character development and high body count, especially in comparison to the Halloween series at the time. Despite this, Friday the 13th was, and still is, wildly popular among horror fans.